I’ve been off work for the last two weeks. Besides spending time with my family back in Middlesbrough and sorting out a couple of things that needed doing at home, I’ve not done much and as a result… I’ve been bored as hell! Thankfully, the book club at work had something of interest this month… a Top Gear cardboard kit. 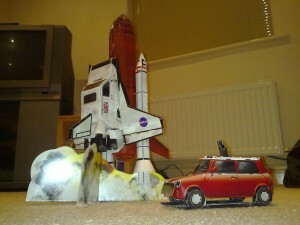 Today I sat down and built Top Gear’s skiing Mini, and their Reliant Robin Spaceshuttle! It was interesting building these. The kits were designed so that not one drop of glue was needed, nor were scissors required to cut them out. I’ve since learned that another kit is available to buy, which features Top Gear’s three aquatic cars. I’m going to look into these as well.